The moon, Earth’s closest neighbor, is among the strangest planetary bodies in the solar system. Its orbit lies unusually far away from Earth, with a surprisingly large orbital tilt. Planetary scientists have struggled to piece together a scenario that accounts for these and other related characteristics of the Earth-moon system. A new research paper, based on numerical models of the moon’s explosive formation and the evolution of the Earth-moon system, comes closer to tying up all the loose ends than any other previous explanation. The work, published in the October 31, 2016 Advance Online edition of the journal Nature, suggests that the impact that formed the moon also caused calamitous changes to Earth’s rotation and the tilt of its spin axis. The research suggests that the impact sent the Earth spinning much faster, and at a much steeper tilt, than it does today. In the several billion years since that impact, complex interactions between the Earth, moon and sun have smoothed out many of these changes, resulting in the Earth-moon system that we see today. In this scenario, the remaining anomalies in the moon’s orbit are relics of the Earth-moon system’s explosive past. Collisional physics calls for this ring of debris—and thus the moon’s orbit immediately after formation—to lie in Earth’s equatorial plane. 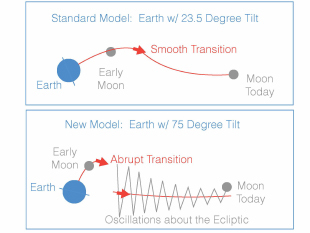 As tidal interactions between the Earth and the moon drove the moon further away from Earth, the moon should have shifted from Earth’s equatorial plane to the “ecliptic” plane, which corresponds to the Earth’s orbit around the sun. But today, instead of being in line with the ecliptic plane, the moon’s orbit is tilted five degrees away from it. Hamilton, with lead author Matija Ćuk of the SETI institute and their colleagues Simon Lock of Harvard University and Sarah Stewart of the University of California, Davis, tried many different scenarios. But the most successful ones involved a moon-forming impact that sent the Earth spinning extremely fast—as much as twice the rate predicted by other models. The impact also knocked the Earth’s tilt way off, to somewhere between 60 and 80 degrees. The model also suggests that the newly-formed moon started off very close to Earth, but then drifted away—to nearly 15 times its initial distance. As it did so, the sun began to exert a more powerful influence over the moon’s orbit. According to the researchers, both factors—a highly tilted, fast spinning Earth and an outwardly-migrating moon—contributed to establishing the moon’s current weird orbit. The newborn moon’s orbit most likely tracked the Earth’s equator, tilted at a steep 60-80 degree angle that matched Earth’s tilt. 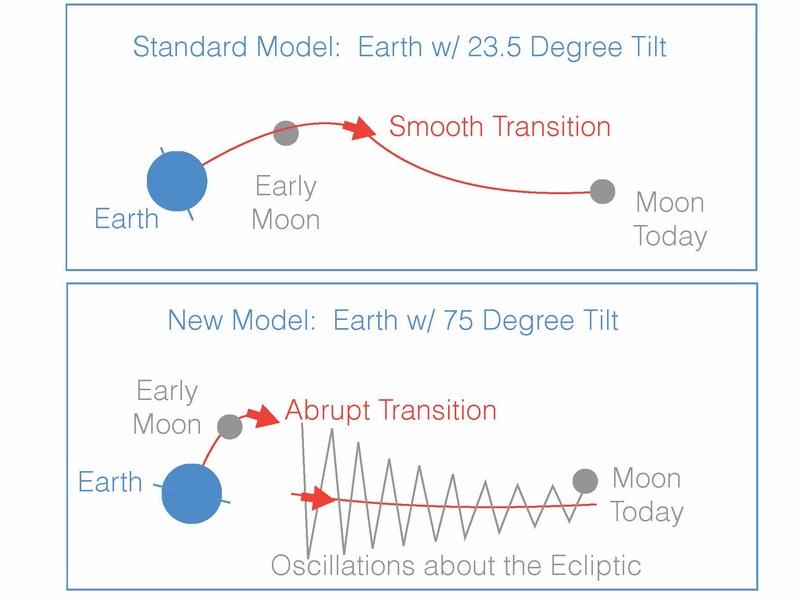 A key finding of the new research is that, if the Earth was indeed tilted by more than 60 degrees after the moon formed, the moon could not transition smoothly from Earth’s equatorial plane to the ecliptic plane. Instead, the transition was abrupt and left the moon with a large tilt relative to the ecliptic— much larger than is observed today. Hamilton acknowledges that the model doesn’t answer all the remaining questions about the moon’s orbit. But the model’s strength, he says, is that it offers a framework for answering new questions in the future. The research paper, “Tidal Evolution of the Moon from a High-Obliquity High-Angular-Momentum Earth,” Matija Ćuk, Douglas Hamilton, Simon Lock, and Sarah Stewart, appears in the October 31, 2016 Advance Online edition of the journal Nature.